Swing ball. Isn't that just a *cough* more boring name for the game known as Zim Zam? 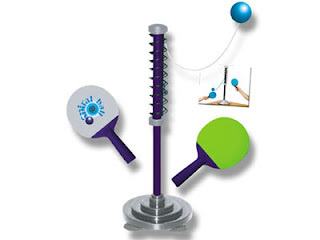 We had a human-size version of this game when we were kids -- and yeah, it was called Zim Zam not some silly swing ball. It had a coil on top of the pole which was stuck into the grass. The ball was actually a yellow fuzzy tennis ball on the string. Wooden paddles -- which would probably be outlawed for today's kids -- were used to bat the ball 'round & 'round. Now you can have it all on your desk but under a lame more "classy" name. What's next for desktop retro fun? Lawn darts?